This listing is in what has become a most desirable neighborhood: Holy Cross, a quiet and gentle area just across the Industrial Canal. It’s a house that was built in 1917 that has undergone a total renovation into a duplex, giving an owner rental income to help with the mortgage payments. However, it would be an easy conversion into a single. The pastel peach exterior is set off by sparkling white columns which run the length of the balcony. Wrought iron makes up the balcony rails and stair rails. There is a large entrance hall on each side, set off by neutral gray paint. The kitchen is painted in shades of rich gray and has granite countertops and stainless steel appliances including a restaurant stove with a hood. There’s also seating for three people at the island that divides the kitchen from the breakfast area. The bathrooms are very nice sized and boast granite countertops as well. “This house is a turn-key duplex with an Uptown-style facade, balcony and owner finishes and floor plans in both units,” summarized Gillis. “With 20 percent down, a loan from NOLA Lending and rent from one unit of $1,100 a month conservatively, a buyer can really live for a net of $747.86 per month for their housing payment and still have two or three bedrooms, two baths, a balcony, granite counter tops and so much more – all for $339,900 and this is not a shotgun. After Hurricane Katrina, Holy Cross became a most desirable neighborhood as the houses that were devastated here by the storm began to be updated and renovated into more modern structures. The Preservation Resource Center began buying, renovating and selling houses here, spurring private developers to do the same. Since flooded houses were cheap to buy, as they were renovated, they became much more affordable to sell than their neighbors across the Industrial Canal. Not only that, but the Holy Cross neighborhood offers a much quieter and more pastoral lifestyle than the nearby Bywater and Faubourg Marigny neighborhoods, yet it’s still close to the city and the Central Business District. Holy Cross is a part of the Lower Ninth Ward; its boundaries are St. Claude Avenue, St. Bernard Parish, the Mississippi River and the Industrial Canal. In Louisiana's colonial era, this area was developed as sugar cane plantations, with narrow lots extending back from the river frontage that provided the transportation and shipping routes. At the start of the 19th century, the portion closer to the river was developed for residential use, at the same time as the Bywater area, across the Industrial Canal. In 1834, the United States Army established Jackson Barracks here. As late as the 1870s, the area behind St. Claude was still mostly small farms with scattered residences. The area on the woods side of Claiborne was mostly undeveloped cypress swamp. The section on the river side of Saint Claude Avenue, which developed as an urban area first, was called the Holy Cross neighborhood for Holy Cross High School, the large Catholic school which was located here. For many years, it attracted students not only from the Lower 9th Ward but also from throughout the city. Construction of the Industrial Canal led to development of the land farther back along the Canal. 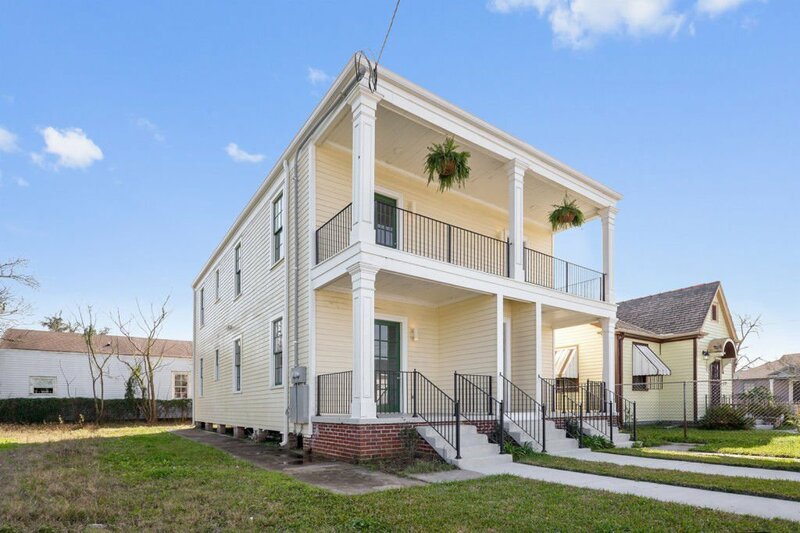 As the once-flooded and now-renovated houses hit the market, more and more New Orleanians are calling this neighborhood home.